Many researchers have proved that young marriages don't last, but a new analysis by sociologist Nicholas Wolfinger at the University of Utah found something more complicated about the relationship between divorce and marriage age. With data from America's National Survey of Family Growth, he found that the divorce rate is more of a bell curve than a hockey stick. The divorce rate is lower for those who wait until their late 20s or early 30s to get married, but it rises if people wait till after their late 30s. Strangely, this seems to be a new phenomenon. During the '90s, a similar analysis showed the divorce rate decreasing with age, no matter how old the couples were. 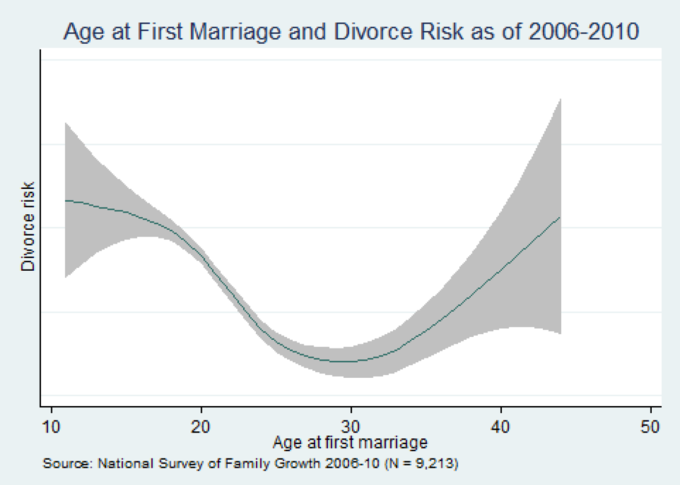 From 2006 to 2010, there seemed to be a "Goldilocks effect": a sweet spot at which the divorce rate was lower on either side. Wolfinger is stumped as to why this change has occurred. "This is the $64,000 question," he told Slate. "I honestly don’t have a great explanation. What I know for certain is it has happened."